Many spectators use the break between the Slalom runs to take stock of the first heat. All of them, however, have one thing in common: they are looking forward to a second run that could hardly be topped in the drama stakes. Fans from Pozza di Fassa hope for a good performance by Stefano Gross. He is starting the second run in sixth position. The fans have given up hope, however, of a podium finish. „The time-lag of 1.53 seconds is just too big“, they regret. Sporting fans from the French Val des Alpes have made the Long trek to support Julien Lizeroux and Alxis Pinturault from the side-lines, which makes the elimination of the Hahnenkamm Combined winner in the first run all the more depressing. 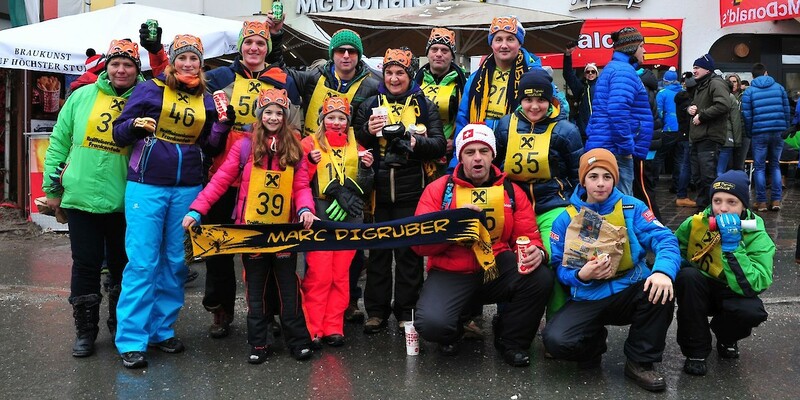 They have a form of consolation, though: „Alexis still triumphed in Kitzbühel with his hat-trick.“ Disappointment also prevails amongst the fans from Frankenfels (Lower Austria), who came to support Marc Digruber.